The books above are some of those I received as Christmas gifts from family members and friends. All new authors for me whom I really look forward to discover. 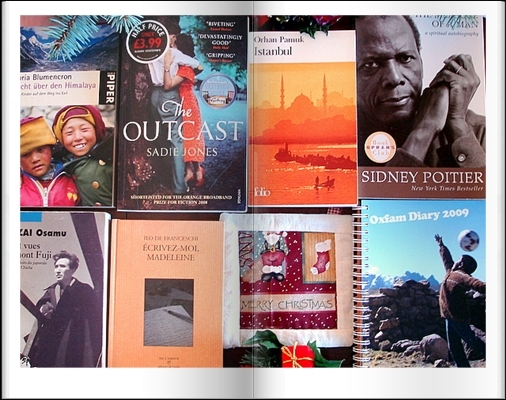 Two I have already read : “The Outcast” by Sadie Jones and “Ecris-moi Madeleine” by Ilo de Franceschi. “The Outcast” is a heatbreaking story set in Great Britain’s Fifties. S. Jones’ subtle style affected me very much and I love her desire to see justice done. I could not stop reading it. A very good book received from a dear friend. These books are “Flucht über den Himalaya” (Fleeing over the Himalaya) by Maria Blumencron, Tibetan children on their way to exile. A nice programme, isn’t it ? ‘Ecris-moi Madeleine’ sounds like something I would enjoy reading. I think it would translate as ‘Write to me Madeleine.’ Many of the others sound interesting too. I am just finishing ‘The Book of Negroes’ by Lawrence Hill. Reading can be so mind-opening and relaxing at the same time. Thank you for your various comments, flandrumhill, I appreciate your thoughts. Oui, c’est bien “Ecris-moi Madeleine”, a very touching correspondance. Being someone who writes a lot (letters), I enjoyed this exchange of letters very much. Hope you have a nice and interesting reading. No day passes without reading a chapter or two. My present reading is “The Innocent Man” by John Grisham. J’ai trop de difficultés avec l’anglais. J’adore regarder tes photos. Et côté livres on a pas mal de goûts en commum. Merci, chère Helena. Ton blog est fantastique. Plein de bonnes idées et de belles réalisations. J´aime le fait que tu utilises de la récup. Tes transformations sont magnifiques. Bravo. Hello Patricia and thank you for stopping by. I read “The Weight of the Farfalla” in French (Le poids du papillon), As far as I know it has not been translated in English yet. I left a comment on a forum about De Luca’s works, if I ever get an answer I will let you know. I read many of his works in French, he is a wonderful author and personality. Thank you for your quick reply. It’s a pity as I wanted to share it with English friends (I’m French). Yes, it’s such a beautiful book at every level. If you liked this one, you might like “Histoire de Tönle” de Mario Rigoni Stern (in French). Merci de votre recommandation pour Mario Rigoni Stern. Je ne connaissais pas cet auteur italien et je ne demande pas mieux qu’à le lire. Je vais m’offrir cette “Histoire de Tönle”. Avez-vous un blog aussi ? Je n’arrive pas à me connecter. J’apprécie visite et suggestions. Sympa.